Energy Savings – Reduction of up to 60% in energy consumption can be achieved in comparison to 10 SEER units, which will reduce the utility bill. Quieter operation – It is less noisy than a self contained window unit, or a packaged terminal unit (PTAC / PTHP), or a central unit. A ductless split system is ultra-quiet because it does not have to push conditioned air through many feet of ductwork, and the nosier outdoor portion of the system operates outdoors. Comfort – A true zone temperature control optimizes your comfort. Even a single-zone or a multi-zone Klimaire INVERTECH advanced DC Inverter technology provides maximum comfort for the entire space by individual temperature and humidity control. By utilizing inverter technology, temperature and humidity fluctuations are minimized, this state-of-the-art electronic climate control also changes the louver direction swings air, to create uniform ambient conditions. When the selected temperature is reached an inverter system runs almost constantly at low economy speed to maintain desired comfort level controlling humidity which is considered vital for comfort. 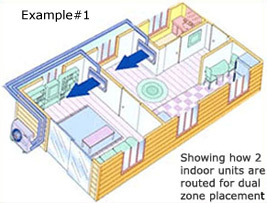 Powerful – By means of a microprocessor Inverter Technology senses the indoor air temperature of the space being cooled or heated and adjusts the speed of the compressor to run at higher speed to meet the demand and quickly reach the set temperature, then slows down to lower rotation speed to maintain it. Convenient – Excellent for remodeling older homes, convenient for retrofitting, vacation homes, cabins, classrooms, churches, nursing homes, restaurants, computer rooms, sun rooms, ATMs, office lobbies and remote offices. Environmentally Friendly – Our units use environmentally friendly R-410A refrigerant designed to prevent the depletion of the ozone layer. Our super high efficiency products contribute to reduce fossil fuel consumption and limit air pollution. $165 Shipping And Handling (ALL BOXES). Includes Insurance. DC Inverter is a type of power conversion circuit that electronically regulates the voltage, current and frequency of a compressor or a motor. 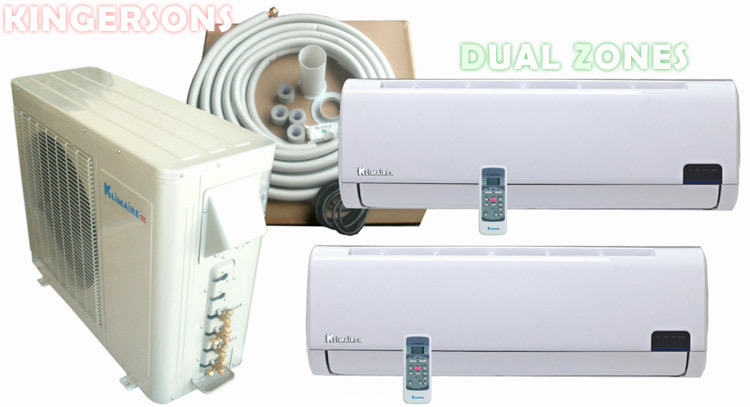 DC INVERTER-driven air conditioners and heat pumps bear special double cam, twin rotary variable speed compressor. Like a cruise control of a vehicle. Inverter technology varies the compressor speed based on cooling and heating needs in the space. Variable speed enables to precisely match system capacity to actual load. They can slow down or speed up based on demand load. By varying the speed of the compressor systems are able to better match load in heating and cooling. In multi zone inverter systems the indoor units constantly change capacity and electronically communicate with the Klimaire outdoor unit to increase or decrease capacity for optimum comfort and save energy. Therefore systems operate more efficiently at light load, while still being capable of increasing the speed to deliver full capacity when needed. Since humidity is a major factor for comfort, in the summer, Klimaire DC INVERTER – driven variable speed compressors reduces capacity to match lighter loads increasing the run time to remove moisture and reduce relative humidity resulting in improved comfort. In the winter, by increasing the speed of the compressor Klimaire air conditioner and heat pump systems are able to maintain capacity and deliver hotter supply air even at low outdoor ambient conditions.